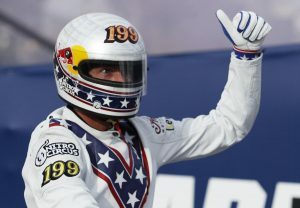 Travis Pastrana paid tribute to America’s most legendary stuntman by successfully landing three of Evel Knievel’s iconic motorcycle jumps in an event called “Evel Live” on the History channel. Knievel was among the most daring ever, becoming an American icon for his high-flying stunts. He passed away in 2007 at the age of 69. The first stunt was a recreation of Knievel’s jump over 50 crushed cars at the Los Angeles Coliseum in 1973. Pastrana jumped the motorcycle 143 feet to clear 52 crushed cars. The second jump was modeled after Knievel’s jump over 14 Greyhound buses in 1975 at Ohio’s Kings Island amusement park. Pastrana jumped 192 feet over 16 Greyhound buses. The third stunt was one that nearly killed the late daredevil. On New Year’s Eve in 1967, Knievel crashed attempting to jump the fountains at Caesars Palace in Las Vegas, suffering numerous injuries. He came up came up short on his attempt, hitting just before the landing ramp, flying over the handlebars and tumbling along the pavement. Pastrana jumped the fountain in the opposite direction of Knievel, due to less space being available for the approach. He rocketed up to about 70 miles per hour before taking off over the fountains, jumping 149 feet to clear them. Unfortunately, the pyrotechnics failed to launch during the jump, with the technicians launching them later out of the center of the fountain.